Tuesday's Child Baby Sculptures is a family owned and operated business located in Narre Warren South, Victoria. Established for over 13 years, we have created thousands of cherished baby sculptures for parents and families. We pride ourselves on the very best personal service and high quality products. 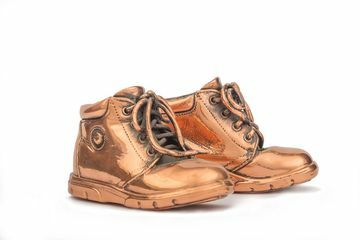 You will love the beautiful lasting memory of your little one's hands and feet .... to be treasured for years to come. There is no age limit! I can create beautiful sculptures for children and family groups of any age. Your appointment takes less than an hour and you have a comprehensive range of frame styles and background colours to choose from. 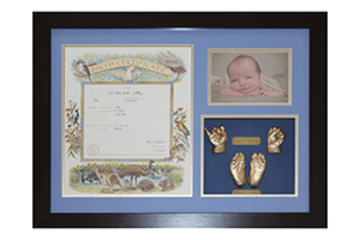 I can also frame your child's birth certificate in frame to match. Buying a gift for a newborn baby can be hard! Many modern families have "everything they need"! A set of framed baby sculptures will never be "outgrown, broken or passed down". Sculptures are a very special and unique gift which will stand out from all the others. Perfect for baby showers, group gifts and a gift from the new grandparents to the new parents! It's an easy transaction, pick up or bank transfer and have it mailed to your door. 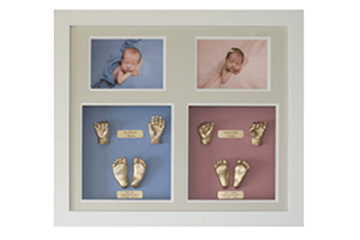 Don't miss out on having a beautiful lasting memory of your little ones hands and feet. Have impressions of your child taken now, and talk to me about my group discount packages.